At Arena Place, Taylor Wimpey East London has demonstrated how a faithful architectural redevelopment project can dovetail perfectly with newbuild design, to preserve the heritage of – and breathe new life into – an important historical site. 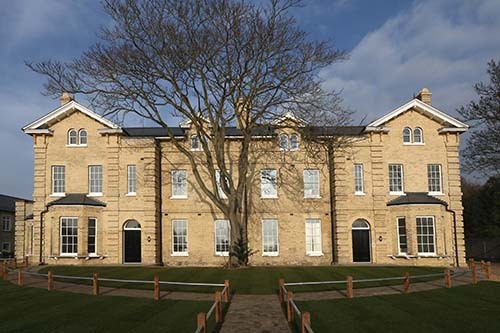 The former Administrative Headquarters for Colchester Garrison Artillery Barracks has been transformed into this prestigious new development, with original architectural features of existing military buildings being sensitively maintained, alongside the thoughtful construction of contemporary newbuild homes, which echo appropriate traditional character.The original accommodation and ancillary buildings represent a range of architectural styles and typologies, and their grouping creates an individual piece of townscape which integrates this site into its local environment. As a listed building and heritage asset, Block A – a beautiful Victorian-age Italianate building – required any changes to be replaced like for like, including its stone-detailed third-floor roofline with overhanging eaves. Other notable design features include barrel-vaulted ceilings, timber windows and shutters.